Clockwise from left: Yuan Shikai, Sun Yat-sen, Li Hongzhang, Dowager Empress Cixi. Towards The Republic a.k.a. 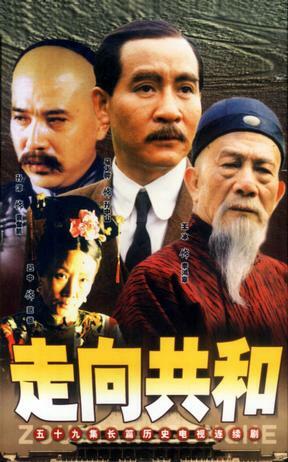 For The Sake Of The Republic (original title 走向共和) is a historical Chinese TV series that first played on CCTV-1 in 2003. It is a somewhat dramatized depiction of the political events in China between 1890 and 1917, a period during which the Qing Dynasty collapsed and was replaced by a Republican regime. The focus of the series is on the key political actors of the period, namely Dowager Empress Cixi, the Guangxu Emperor, Li Hongzhang, Yuan Shikai, Kang Youwei, Liang Qichao, and last but not least Sun Yat-sen. Surprisingly, Cixi and Yuan, which in official Chinese historiography tend to be dismissed as self-interested and corrupt, are portrayed in a fairly positive manner. A detailed synopsis of the episodes can be found here . Alas, Poor Villain: Cixi and Yuan. Artistic License  Ships: Both the Japanese and Chinese ships during the First Sino-Japanese War are too advanced for the era, presumably because no lifesize models of period-appropriate ships were available, and the production made do with more recent vessels. Author Filibuster: Sun Yat-sen's final speech in the last episode. Banned in China: The last episode was stopped to be broadcasted in re-runs for political reasons (it ends with a speech by Sun Yat-sen about the merits of democracy) after its first run. Deadly Decadent Court: The imperial court at the Forbidden City. The Drag-Along: Li Yuanhong. He only accepted the leadership of the revolutionary armies in 1911 because he had no other choice. His own soldiers had to drag him out from under his concubine's bed where he was hiding. Driven to Suicide: Commander Liu Buchan and Admiral Ding Ruchang both kill themselves out of shame for losing the First Sino-Japanese War. Evil Chancellor: Controversially subverted with Yuan Shikai. Face Death with Dignity: Tan Sitong. Fashions Never Change: Averted. Between the beginning and end of the series, fashion visibly evolves, and men who in 1890 wore traditional Chinese clothing have generally adopted Western dress by 1917. Gunboat Diplomacy: How foreign powers behave in China throughout the period. Historical Villain Upgrade: Cixi and Yuan. Hobbes Was Right: Disputed; possibly the reason why Yuan is portrayed positively. Important Haircut: When Sun Yat-sen, in a fictional scene, cuts off his braid and dramatically throws it in the air to symbolize his rejection of the Qing Dynasty (all Chinese men were required by law to wear the braid as a sign of allegiance to the dynasty). MayDecember Romance: Li Hongzhang is offered a young concubine by the Dowager Empress to keep him company in his old age. And the middle-aged Sun Yat-sen marries the much younger Song Qingling. Peace Conference: In 1895, Li Hongzhang is sent to negotiate peace terms with the victorious Japanese. Pet the Dog: Several scenes show Yuan as an attentionate and loving husband, especially to his main concubine, whom he rescued from a life of prostitution. The Revolution Will Not Be Vilified: It was! Just ask Jiang Jieshi. She Is All Grown Up: When Sun Yat-sen first meets Song Qingling, she's a little girl. When he sees her again years later, she's turned into a nubile young woman with a definite crush on him. Villainous Breakdown: Yuan when his attempt to set himself up as emperor met with complete failure.